Personally, I don't get caught up in hyper-nationalism. That said, my head nearly hit the ceiling when I jumped off the couch after Landon Donovan's extra time goal against Algeria, the seminal US moment in the history of the sport. And while we have gotten caught up in the gaffes and grit of the American squad in the knockout round, I feel we haven't given Ghana enough credit. The difference-maker was the stellar goalkeeping from Richard Kingson. Without his constant thwarts of American opportunities, Asamoah Gyan's brilliant individual moment in extra time never would have been possible. 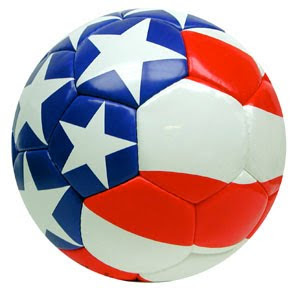 The United States (the “Yanks” to the rest of the world) were brave to the end in the 2010 FIFA World Cup, but a bad habit sunk the ship… allowing a goal in the first 15 minutes in soccer is akin to giving up 3 runs in the first inning, the opening kickoff return for a touchdown, a 15-0 run to start an NBA game, you get the point. Nothing that is insurmountable, but a hill to climb nonetheless. Only so often can you go to the well of courage, of the adrenaline needed to save yourself late in a game. That well has a meter that must be recharged before use, and when using it in consecutive games, it often runs dry… that is what happened to the USA in South Africa. Everyone has a “want to”, but in the end, it is execution that counts… why do you think the Germans are as good as they are? For all time, they have been known as cool and calculating, as a people and as a soccer team, both attributes that work well in pressure situations. USA are a very close knit team, one that has fought for each other and for their shield, but in the end it was execution that failed them, not a lack of heart. Poor defending and the inability to wake up in time to avoid an early deficit eventually wronged this team. Asamoah Gyan of Ghana scored what could be the best goal of the World Cup in extra time, but in the end, should never have gotten a foot to that ball. Watch the better teams defend those long passes, and you will find that none are complete. The goal Ghana scored in extra time was the equivalent of a Hail Mary, and once that was completed, the United States’ fate went with it. The why’s and why not’s are irrelevant, as soccer in this country will unfortunately be in about a week. If the USA had advanced to play Uruguay in the quarterfinals (a game they would’ve been a pick’em in), a spot in the semifinals would have been well within reach. They didn’t look past Ghana, but somewhere deep in their hearts, they knew that a semifinal match with Brazil was in their sights, and the thoughts of the furor for that game in the US, of what could have been, will invade their sleep. The core of this team now has this sour taste of dashed hope in their mouths, and when World Cup 2014 comes around, this group will be what we would call ”experienced”, and a mix of the two may be enough to see the same type of result, a result, though, that isn’t good enough for this nation to take seriously. In the end unless somewhere in America the next great US-born goal scorer (or maybe the first), is 16 years old playing for his high school dreaming about being the one to bring glory to the red-white-and-blue, going any deeper in this tournament would be an upset to say the least. For a nation that excels in international sport, the effort showed in South Africa can make us proud, but we must also see how far behind the rest of the world we are. Major League Soccer provides a rising level of talent, but a world-class team won’t be built in our domestic league, as the best teams in the world are (England’s entire team play in the Premier League in England), so where the future of US Soccer is now is unknown. Bob Bradley’s future is also unknown, but I hope he stays on, even after his horrible decision to take Maurice Edu out of the starting lineup for the Ghana game. Landon Donovan and Clint Dempsey should be ready to take a last run in Brazil 2014, their place in the tournament through qualifying is all but a foregone conclusion over the last 20 years, so a chance will again be there for the Yanks. But until this nation pays attention more than once every 4 years, and starts to demand success, the US Soccer program will continue to be what it is now, a competent side who at times look like world beaters, and always play to the final whistle, but in the end are a beatable team that was a welcome sight in the round of 16 for Ghana. Say that out loud, “Ghana were happy to have to play the USA in the round of 16”… it just doesn’t sit right with me. I am proud of the way the USA battled and continued to play hard to the end, and a little amazed that we aren’t more interested if only because we are going to play this event as long as it exists, and I for one would like to see the USA go to a World Cup as one of the favorites to win, instead of a team just hoping to get out of the group stage. I am not sure I will see that in my lifetime. Team USA had a lot of work to do to beat Ghana. They have never been able to beat Ghana! I was hoping this time will be the time when we did beat Ghana, it was a game they played hard to win. Unlike Mexico. Poor losers!